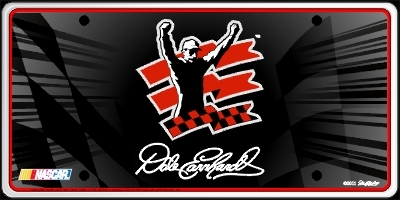 Standard Signature Series Dale Earnhardt Race Plate™ Bright, reflective high intensity graphic designs. High quality, long-lasting aluminum souvenir plates. These plates are much higher quality than the traditional plastic and tin souvenir plates on the market. All plates are standard size 12” x 6” with standard bolt holes. Our plates are made from the same high-grade aluminum that state governments use for registration plates. Our reflective graphic coating that brighter in the day and almost appears to light up at night when struck by light. © 2011 Dale Earnhardt Inc.
An additional charge of $0 is applied to each personalized plate. Please allow two weeks additional shipping time for personalized Race Plates™. Actual font may vary slightly from illustration due to differences in computers and software. Race Plate Marketing, LLC reserves the right to refuse any personalization requests. Collectible Series Race Plates™ are souvenir plates and should not be used in place of legal registration license plates.